Disability research has historically not been driven by the needs of the disability community, writes Kate Finch from People with Disability Australia, who explains why disability-led research is vital for people with disability to tell their own stories. 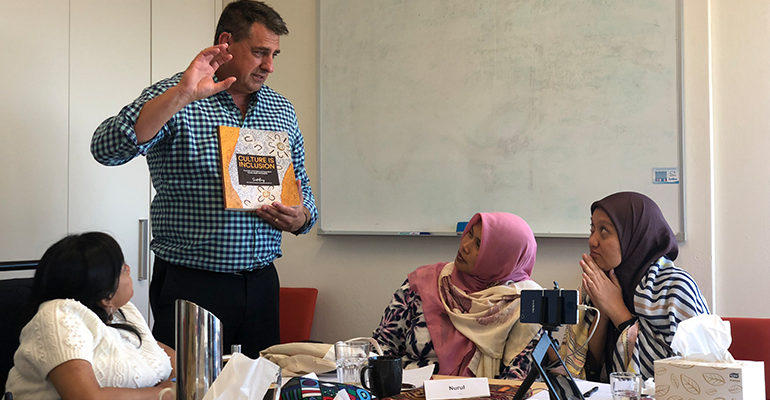 Scott Avery presents a copy of his book “Culture is Inclusion” to visiting Indonesian DPO delegates. People with disability from Australia and Indonesia met this week to discuss a new and evolving area of research that puts people with disability in the driver’s seat and in control of our stories. All too often, research about disability is done by non-disabled people, with little or no involvement from people with disability. Research that includes our expertise and knowledge about our own lives is richer and more substantial. This week’s workshop is being held by People with Disability Australia (PWDA), an Australian Disabled Peoples Organisation (DPO), Sydney University and two DPOs from Indonesia, Lembaga Sapda, Dria Manunggal and a representative group for children with disability, Wahana Keluarga Cerebral Palsy. 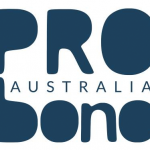 A DPO is an organisation that is controlled by people with disability (at least 51 per cent people with disability at the board and membership levels). A DPO is different to other disability sector organisations because it is “for us, by us”. Leyla Craig, from Deaf Society NSW, who has undertaken research with deaf communities in New South Wales and the Philippines on disaster response accessibility, spoke of the importance of inclusive communication in disaster response and management. “Some words in the disaster context do not have a sign in many sign languages,” Leyla said. She said work that was being done in the Philippines by local groups to find locally appropriate signs to communicate such disaster concepts to deaf people in the community. There is a considerable focus on disability research, both in Australia and internationally. But historically, this research has not been driven by the priorities and needs of people with disability, nor has it been inclusive or participatory. Research conducted by people with disability and their representative organisations is not viewed to be as valid or legitimate as the research initiated and conducted by universities and independent academics. Scott Avery from First People’s Disability Network (FPDN) spoke about his ground-breaking research with Aboriginal and Torres Strait Islander people with disability, and the importance of community-based research. Scott spoke of the importance of people with disability being able to tell their stories in their own way and retain ownership of the experience. “When I came into community I had only one question – ‘What is your story?’, and I just followed it through,” Scott said. People with disability are increasingly challenging the exclusivity of research as a commodity “held” by academia. After all, people with disability and DPOs have unique knowledge, and are experts in our own lives. As organisations of, and for, people with disability, DPOs conduct research that is appropriate and relevant to their communities, and which brings a perspective to the policy landscape that cannot, and should not, be sought elsewhere. Therese Sands from PWDA spoke about the Stop the Violence Project (STVP), which was led by Women with Disability Australia (WWDA) in partnership with PWDA and the University of New South Wales. The STVP project provided the Australian government with disability-led research on the issues of domestic and family violence facing women with disability. Therese spoke of the importance of reporting back to the women with disability who took part in the research. “If people with disability are going to tell their stories, they need to get back what they said and be told how it is going to be used,” Therese said. This collaborative, community-led research workshop is another step towards a future where people with disability have more of a say about research about us. About the author: Kate Finch is the director of strategic projects and organisational development at People with Disability Australia.